In the last post, we discussed the First Great Awakening, the religious revival that shook America to the point of fixing their cultural base. In this addition to The History of America, the objectives of mercantilism will be presented to a 17th-to-18th century America. For centuries, the English government was more than happy to let the American colonies run themselves. As I’ve pointed out in previous posts, England neglected the colonies for centuries, allowing them to create their own false minor political regimes and feel as if they were their own people. However, in the late 1600’s, this changed drastically. It’s not as if England automatically decided to take control in the late 1600’s, however. In 1634, Charles I established a board of commissioners with the job of overseeing colonial development. This group, which sucked money from the unwilling Parliament, was incredibly unpopular, incompetent, and ineffective. In fact, when Charles I was executed in 1649 for treason, the board of commissioners was sacked. Charles II organized a council for trade and plantations in America which almost immediately failed. Then he attempted a board of commissioners, which failed. The Lords of Trade, created in 1674, also failed. In 1696, the idea was overhauled and renamed the “Board of Trade.” Nothing in this so-called board was effective, and the plans to control the unofficial governments of America were never funded or supported by the Parliament. The government of England still considered America as nothing more than a place to dump their unwanted; but much to their dismay, they soon realized that the unwanted men sent to America — for reasons such as disrupting the English economy by accomplishing and contributing nothing — had turned into producers. Producers that threatened to make England dependent on its own offspring, even! Enlightenment ideas caused the people of Europe to change their opinions on even the slightest thing, and the idea of mercantilism soon began to make sense to the people of France and England. 1. In this world, there is a fixed and limited amount of wealth gifted to society. Economists, which is an awkward title to use here since the actual term was coined in the late eighteenth century, argued on what exactly this wealth was. Some thought silver, some thought gold, but a majority began to think of it as something different: land. 2. If a specific nation wishes to become a world power and obtain more wealth, they can only do so by taking wealth from another nation that already has it. This can be done one of two ways: through trading or through war. If a nation believed that a government managed their land during war, then why exactly would that same government not regulate trade? 1. A government should regulate their nation’s trade. A nation can only make itself rich off of other nation’s wealth, but one must realize that it is the same for any other country. Your nation must be able to get rich off of other nations through trade while also protecting their own products and currency. 2. A government must defend its nation by erecting tariff barriers. The nation’s government must be able to protect their own farmers and workers from prices that are too high on their own territory. A nation must make sure that their prices are lower than products coming in through trade so that their own people won’t buy from other countries attempting to gain wealth. 3. A government must arm their nation by targeting the economic weaknesses of rivals. In order to gain wealth, your nation must be able to drain the economy through trade. To accomplish this, the government should attempt to trade what other countries want at a low enough price to where people wish to buy it instead of their own countrymen’s products yet high enough so you can still make a profit. 4. If all else fails, go to war. A government must coordinate all economic policies and link it, somehow, to military policies. By doing so, they strengthen the national military while gaining enough money through trade, or during war, to make efforts worth it. The people of France attempted these strategies first, and French “Economistes” advised their absolute monarch through a list of three recommendations. 1. Rationalize the tax structure! Taxes had always been put on the poorest percentile of the nation or on the merchants that run small businesses. The “Economistes” realized that the absolute ruler shouldn’t tax the tiny corporations with minuscule amounts of cash, but instead tax the aristocrats with large sums of land. In their minds, real wealth was in land. 2. Impose tariffs on English and Dutch imports. This would keep the rival nations of England and the Netherlands from making a profit on France’s economy. This also stabilized the strongest industries in France, making prices cheap enough so that the English and Dutch citizens wished to buy their products more than anyone else’s. 3. Organize the colonies to serve for the French economy. Colonies could not refuse the requests of an absolute ruler. Therefore, colonies had to listen to regulations. They could not set up tariffs against their mother country, much like a small child can’t leave their home. France would shut down colonial manufacturing that rivaled their own. This would allow the colonies to work for the benefit for France and not themselves. And, of course, if all else fails, the absolute ruler could force the colonies to get involved in war. The royal governments of Europe fell in love with these ideas almost immediately, and in 1689 the Parliament of England abolished all taxes on grain to drive down prices. This allowed English grain the cheapest in the world, and it sold quickly abroad — forcing countries to become dependent on Britain. Less than a year later, in 1690, the Parliament banned the sale of French liquor to encourage the manufacturing of English gin from, you guessed it, English grain. That same year, a centralized English bank was created to stabilize the currency. To make their economic power even stronger, the Parliament would force Scotland into “The United Kingdom” in 1707, successfully “taking” the wealth of another nation. This is around the time where trading regulations with the colonies became a reality, and the Navigation Acts formed. Parliament gradually took control of the new American economy step by step through the shipping industry. The American colonies could only ship to England, and they could no longer sell anything to anyone else without stopping in an English port first. Meanwhile, England fought several wars with the Dutch and the French. The English colonies were semi-forced into these wars as well. However, three thousand miles of ocean made these rules hard to enforce. Smuggling and bribery engulfed most shipping ports of America, and many American fortunes were made before the revolution. These regulations also helped the colonies as well. The Iron Act of 1750 raised prices on iron imports from Scandinavia, stimulating the birth of the great American Iron Industry. The New England shipping industry also boomed due to the new shipping laws. Also, involvement in British wars showed the formerly unwanted citizens living in the colonies that they were in fact apart of the British Empire. This was during a time where a majority of people living in North America wanted to be seen as British and not worthless. 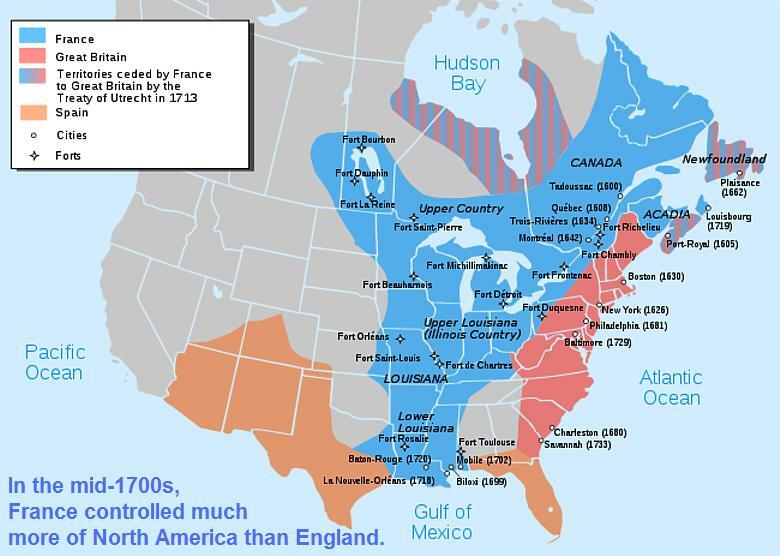 By 1700, the British population in America was five times greater than the population of France’s territory of New France. This made the Native Americans of the country like France more than Britain, as the small French population had no hunger for land. In 1704, Indians with French support killed nearly fifty settlers and captured over a hundred more to hold as ransom. In 1739, England went to war with Spain, and the War of Jenkins Ear” somehow turned into a large scale brawl between France and England. In 1745, a New England expedition led by William Peppenell (1696 – 1759) set off to capture the great French fortress of Louisbourg in Nova Scotia. These skirmishes throughout North America were nowhere near anything important at the time, as three years later the fort was returned. In 1748, however, British fur traders and land developers decided to move to the Ohio River Valley, which was located in New France. The French saw this as an intrusion, and began to build a line of protective forts — including Ft. Presqu’ Isle, Ft. Frontenac, Ft. Le Boeuf, Fr. Venango, Ft. Niagara, and Ft. Duquesne. This was meant to protect the French community, but it created many issues with everyone. 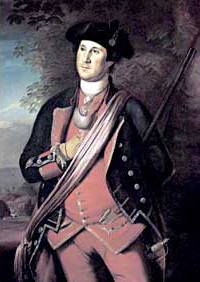 In 1754, Robert Dinwiddie (1693 – 1770), a governor and land developer of his own, sent 150 Englishmen to Ft. Duquesne. He hoped this ragtag group would be able to stop the construction and put an end to this barrier being formed across the border between New France and the British colonies. This group was put under the control of a man named George Washington. The men arrived too late, however, and they were unable to put an end to the construction of Ft. Duquesne. Instead, they put up their own fort, which was promptly named Necessity. Washington and his men were defeated, disarmed, and sent back into Virginia. Eventually, the Seven Years’ War, also known as The French and Indian War, began. The Great War for control of North America and expansion of empire began, and for the first three years — everything went wrong for England. A colonial parliament was appointed by the king and designed by Benjamin Franklin, but it broke down in failure before it could even begin. New France’s best general, Marquis de Montealm (1712 – 1757) began to send French troops to take over English forts. However, in 1757, the tides turned for England. William Pitt (1708 – 1778) became Prime Minister of the United Kingdom, and the first thing he did was appointing his own men in the military. Robert Clive (1725 – 1774) defeated the French across India in 1758. Britain managed to push France out of Africa entirely. And Britain seized island after island in the Caribbean. Jeffrey Amherst, George Howe, and James Wolfe were all appointed in America, and in the summer of 1758, Amherst captured Louisbourg and forced French forts to be abandoned.By 1759, all the French forts had fallen. Quebec fell to the British. In February of 1763, the Treaty of Paris was signed, and all of New France became British Canada. Britain had finally done it — they had eliminated its main rival and had become the main power in the western hemisphere. 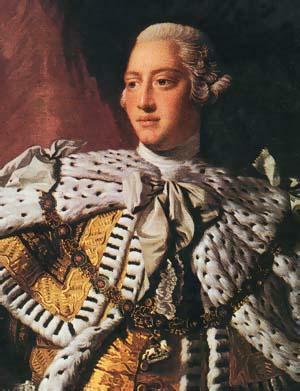 When George III (1738 – 1820) became monarch of Britain in 1760, Americans celebrated with bonfires, fireworks, and feasts. They had rejoiced at their role in the war, and had finally felt like British citizens. Members of this great empire at last. And that wraps up the ninth post in this brief history of America. In the next post (the last of the previously written backlog), we’ll be diving deep into a debt-riddled Britain and the final steps leading to the American Revolution.